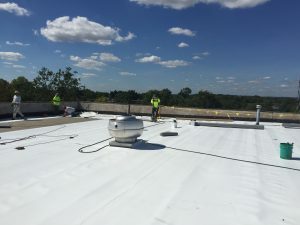 Commercial Roofing Contractors New Brunswick | Roof Repair New Jersey | Flat Roof Repair 08901 - S & S Roofing Inc.
At S & S Roofing we pride ourselves on providing quality service to the commercial roofing industry for over 30 years. Ranked as a Firestone Master Contractor in 2016 for our sixteenth consecutive year, we have completed thousands of projects on the east coast to support our reputation. We provide high quality commercial and low slope roof installation, repairs, inspections, and routine maintenance. Ensuring your roof is properly installed and maintained throughout its lifetime will help secure longevity on your investment and safety for the patrons of the building. Didn’t have your roof installed by us? Not a problem! At S & S Roofing we understand that regular maintenance is crucial, regardless of who installed it. Our team is educated and experienced in every service facet we offer, while providing unparalleled customer service. S & S is here to provide the solution to all your commercial and low-slope roofing needs. Contact us today to schedule a roof inspection or visit our site to learn more about our services and prior projects.